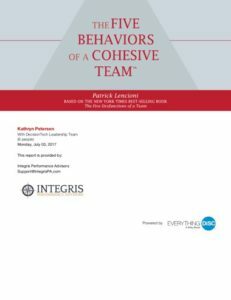 A comprehensive, highly personalized, and accessible 36-page illustrated report that allows each person on the team, and the team as a whole, to understand how they scored on the assessment and how to interpret their individual and team results. The profile includes an introduction, a section devoted to each of the five behaviors, a summary of the team’s strengths and challenges, tips, and suggestions, and a roadmap to help teams create an action plan based on their results. Team dynamics are an important predictor of organizational health. Teams that work well together perform better. Download The Five Behaviors Powered by Everything DiSC Sample Profile.